We offer tailor-made travel packages for professional and amateur tennis players. Even if you’re not the most passionate tennis fan, or travelling with people who want to break from a tennis programme – don’t worry, there’s an amazing choice of other exciting, cultural as well as sporting activities, in all of our amazing destinations. Our tailor made tennis holidays are designed for individuals & groups. Individuals can choose from our programmes carefully designed across destinations and different dates. For group of people travelling together, we are happy to create special programmes on a request basis. Tennis Holidays Croatia is staffed by a team of highly motivated and experienced tennis and travel professionals. – our passion for playing and coaching tennis and creating exciting holidays. Our mission is to deliver a perfect tennis holiday – a bespoke itinerary served specially for YOU. Over 17 years of professional teaching experience in Croatia and abroad. As a junior, Bojan competed at National level followed by many successful years in the German League. He has had much success in running tennis clubs in Croatia and Germany. Bojan is not only a passionate tennis player, but also a travel expert who knows Croatia inside out and is always ready to organize your new travel adventure. Along with 15 years of experience in running tennis clubs, he is skilled in organizing and delivering many exciting travel packages. Currently: Lives in Zagreb, Croatia. 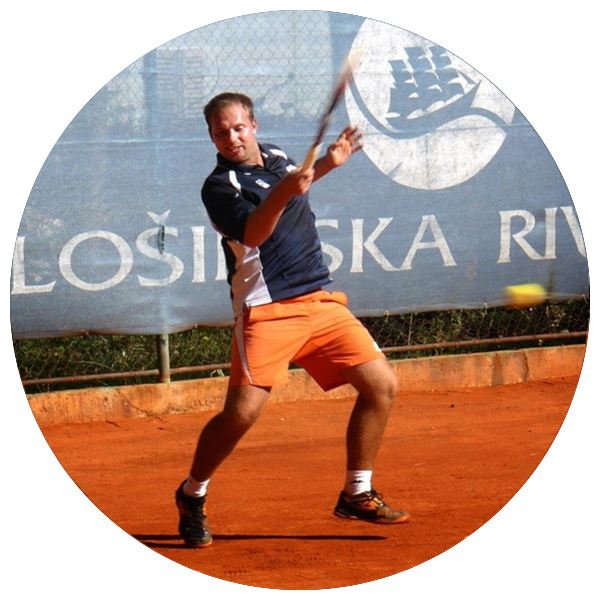 Bojan runs tennis programmes within schools in Zagreb and owns a successful travel company called Sport and Travels. Combining these 2 passions, Bojan was the original founder and idea behind Tennis Holidays in Croatia. Coach in destination Biograd na moru. He has been playing tennis since early childhood. He has over 25 years of coaching experience with private lessions and group lessions. Worked in Usa summer camps and France. Currently works in Iva Majoli tennis academy. Finished studies of Geography and has good knowledge of all Croatian turistic destination. He started playing tennis when he was 3 years old and achieved remarkable results in Croatia and abroad. He has been coaching since 2009. Polona Hercog, Slovenia, No.90 WTA. Petra Ivanišević, No.15 in Croatia in the category up to 16 yrs. Leopold Mužić, No.62 in Croatia in the senior category. As a coach, he placed an international ATP-coach certified B.